This is really a very delicious halwa. I didnt expect that this halwa would turn out this much good. When i made this halwa and gave to my family members, they were asking whether this is almond halwa…. ha ha ha.. nobody believed it, it is made of the channa dal/kadalai paruppu. After i showed the step wise pictures only even my hubby believed… I am very happy and proud to join the group SNC started by Divya of You too can cook Indian Food and realise now, that I should have joined it before itself. Missed many delicious recipes… wahhh. Though I prepared this halwa in the first week of March itself, but now only, found time to post it. Now I am really waiting for the next exciting challenge. Wash and Soak channa dal for 2 hrs. Filter the water and drain completely. Grind the channa dal with cardamom powder in a food processor or mixer grinder and make a powder. ( little coarse should be ok). In a non stick wok, add the 4 tsp ghee first and add the powdered channa dal and star stirring. To this add the sugar and grated khoya. Keep on stirring, until it thickens. Add the fried, cashews and raisins, and almonds. Grease a plate with ghee, and transfer the content and allow to cool. The halwa texture is simply awesome..
lovely click and neat simple write up..happily following u, Akila! 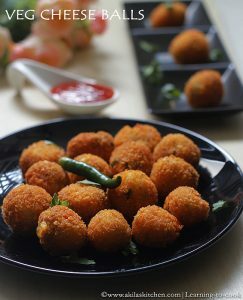 very tempting and mouthwatering..especially clicks are awesome…Keep it up.. Delicious halwa and nice presentation..
Awsome clicks…Halwa is oozing out of the screen..
halwva looks very yummy…nice clicks…. Halwa looks simply divine,love to have some spoons rite now. Stunning pictures, and beautiful lay out. The halwa looks good enough to die for. Excellent, excellent post. Nice and lovely Halwa, it is mouth watering. Thanks for sharing. VEry tempting halwa, have tasted this only at weddings, thanks for the recipe. Akila I am glad you posted a different version of the recipe. The sugar proportion sounds correct. very very tempting halwa.. Yummy !! yummilicious halwa, looks very tempting dear. Wow! this looks amazing Akila..
neatly presented.Love the addition of khoya.it looks so yummy,tempted to prepare as u have added only little ghee. Your clicks were too tempting had to hop to see the post, very well made with attractive clicks. That is just lovely. Very tempting halwa, indeed. I think the addition of Khoya makes it all the more yummier.